A shameless plug for an anthology I've edited collecting rare Australian weird tales from the 1860s to the 1930s. The book forms part of Wordsworth Editions' admirable Mystery & Supernatural series that publishes rare and out-of-print volumes at budget prices. 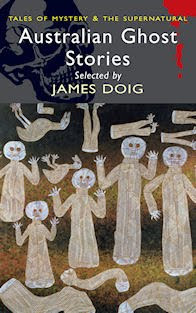 Australian Ghost Stories collects what I believe are the best stories of their kind published in Australia or by Australians during the golden age of the supernatural tale. It includes stories by well-known Australian writers such as Henry Lawson, Edward Dyson, Marcus Clarke and Guy Boothby (of Dr Nikola fame), as well as lesser-known authors such as Roderic Quinn, Mary Fortune, Beatrice Grimshaw and Ernest Favenc amongst many others. I'm hoping the anthology will showcase some neglected Australian writers of popular fiction. picked this up today and, on the strength of the introduction alone, this promises to make for fascinating reading. i am particularly looking forward to the Ernest Favenc pair and James Francis Dwyer's 'The Cave of the Invisible' as i fondly recall his 'A Jungle Graduate' from one of the Hitchcock anthologies ('Stories They wouldn't Let Me Do on TV' ?). very well done, James, and well done to Wordsworth, too, who've published much excellent material these past four years.